Every semester I celebrate the completion of the book, Huckleberry Finn with a regatta. It's a simple idea, really. Eyeballs aren't the sole requirement for reading books. It takes minds. And minds long to put great ideas into action. Our schools' shop teacher, Coach Anderson, takes over my class for a day, teaching students how to lash cut pieces of wood together to make a raft. 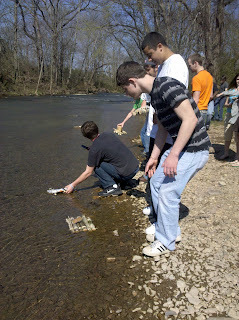 Students bring in their own doodads to personalize the rafts. Then, on one glorious Friday, we launch them in Station Camp Creek. We watch them glide past snags, through rapids. We groan as they get stuck in "dead water" or trapped in sloughs (can you see the vocabulary at work here?). Students return and write stories about their rafts' adventures. But there's more. I have always dreamed of rafting on the Cumberland River (which is about a mile downstream along the creek). 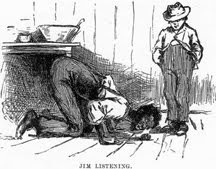 I don't just want to read Huck Finn, I want to be him. Weareteachers.com recently launched a contest: create a popular teaching idea and get $200 funding and a Flip camera to record the lesson. I jumped at the chance. I'm ready to build a real, life-sized raft--my classes with coach Andy's. I'm ready to put it into the water at Bledsoe Creek State Park (about 12 miles away) and float it all the way back to my school. I'm ready to dress myself in rags and wear a straw hat. I don't care. I just need your vote. Go to the contest. Vote for my project (pretty please). Let's see if we can win this thing!